Published: Jan. 25, 2013 at 11:16 a.m. Updated: Jan. 25, 2013 at 03:36 p.m. The old Vernon Davis might have complained when he caught only six passes for 61 yards in the final six games of the regular season with Colin Kaepernick at the helm. The old Vernon Davis has left the building. "As the team was winning and having success, I'd probably have been the one complaining," Davis told Mike Silver of Yahoo! Sports. "I would have probably been in the media, making a scene, going to the coach and just being a cancer to the team." The Mike Singletary era was full of letdowns and embarrassment for the San Francisco 49ers, but he deserves a lot of credit for turning Davis' career around. It's been more than four years since Singletary's banishment of Davis and subsequent "I want winners" speech, a moment that Davis says helped shape him. "As I think back, I think I was more concerned with the guys before me ... guys like Steve Smith and Chad Johnson (who) wanted the ball," Davis said. "It was like, 'Throw me the ball.' So I looked up to those guys and figured that that was the way to go, that was the route. But it wasn't. It definitely wasn't the route." Davis is counted on to block more than ever now. His numbers in 2012 (548 yards, five touchdowns) were the lowest they've been since the 2008 season when Singletary took over. But a five-catch, 106-yard effort in the NFC title game reminded everyone what a force Davis can be. The 49ers have better offensive weapons now. Michael Crabtree is a true No. 1 receiver and the running game is stronger than ever. But Davis remains the biggest matchup problem for defenses. The 49ers are better when they feature Davis more, and Kaepernick is great at passes up the seam. 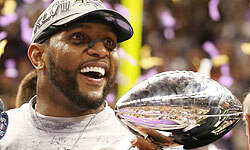 I'd like to see the Baltimore Ravens' safeties (or linebackers) try to cover Davis in Super Bowl XLVII. Ravens safety Ed Reed isn't physical enough. Bernard Pollard is too slow. Don't be surprised if Davis comes up big again on the huge stage.